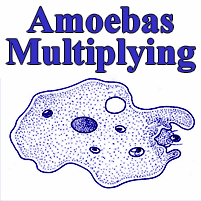 Amoebas are small organisms that reproduce rapidly. They double every minute. In 1 hour they filled half a bottle. How long will it take to fill the whole bottle? Answer: 1 hour and 1 minute. Speaking of doubling, learn to get your audience doubled over with laughter. Check out our winter break entertainment camps!